Changing the way users capture still images and video with a DSLR camera, Canon EOS 70D is a trailblazing powerhouse featuring a revolutionary autofocus technology that unlocks the potential of live view: dual pixel CMOS AF. This game-changing technology allows the EOS 70D to capture video in live view with smooth and precise autofocus similar to that of a camcorder, complete with the superb image quality that is a hallmark of EOS cameras. 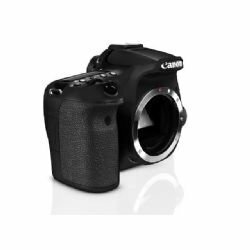 Additionally, dual pixel CMOS AF provides fast and accurate autofocus during live view still image capture, enabling you to fully benefit from the freedom of angle allowed by the vari-angle touch screen 3.0-inch clear view LCD monitor II. Compositional options are now nearly limitless with the two real-world choices of live view and viewfinder shooting. Built-in wireless technology and the EOS Remote app further enhance shooting versatility, as well as enable easy sharing. Brilliant image quality is provided by the EOS 70D's 20.2 Megapixel CMOS (APS-C) sensor, a first for an EOS camera with an APS-C sized sensor. A powerful DIGIC 5+ image processor supports continuous shooting up to 7.0 frames per second, as well as an extended ISO range of 100 - 12800 (H: 25600) that allows shooting in a wide variety of lighting conditions. Stunning photos can be accomplished using the remarkable 19-point all cross-type AF system with a high precision dual cross f/2.8 center point, and advanced display options available on the Intelligent Viewfinder supply exceptional control. In-camera imaging features like HDR, HDR backlight control, multiple exposure, handheld night scene, and creative filters available in real time help turn even simple images into spectacular photos. Elevating the possibilities of creative expression to extraordinary new heights, the powerful EOS 70D with dual pixel CMOS AF places the ability to capture both amazing stills and video right in your hands.